Miralax is a natural, gentle laxative that comes in a powder form. It comes in three sizes: a 8.3 oz bottle, a 4.1 oz. bottle and a single serving packet. The Miralax powder is simple to use, the user measures the suggested dosage and stirs it into the beverage of choice. This product can be used in any beverage of choice, whether it is hot or cold. 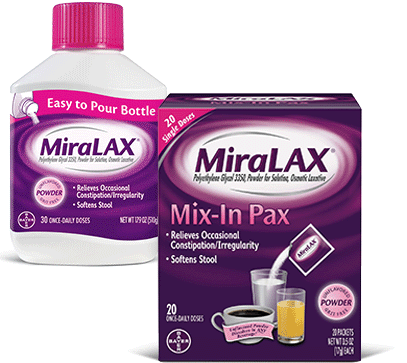 Drinks that can be used with Miralax laxative powder include ice tea, water, juice, smoothies, orange juice, seltzer, coffee and tea. 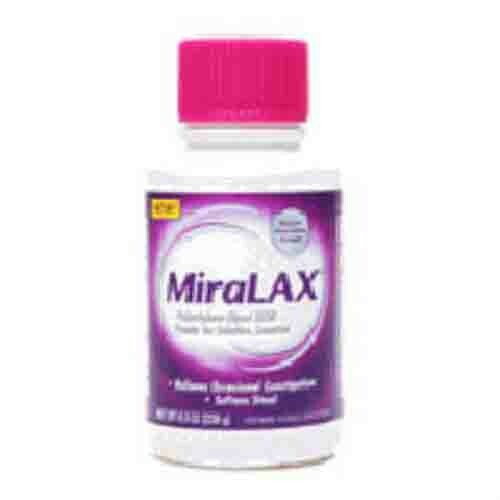 Miralax can be used by adults who have occasional irregularity and constipation. For children and teenagers please ask your doctor if this product is right for them. Miralax works by taking the water in your body and directing it to the colon. This allows your body to naturally produce a bowel movement without forcing your large intestines to contract with harsh laxatives and medications. Since the product uses the body’s natural processes users will not experience bloating, gas or cramping. Do not take for longer than 7 days in a row. If you have not had a bowel movement after taking this product once a day for 7 days, please see your trusted medical professional as you may have a more serious medical condition. If you need other constipation products that are stronger please visit our Fleet Enema or our other stool softeners. On your miralax packets 11523726808: Do the individual packets have a scan-able barcode that we can use in the hospital with our MSDS unit? There are no individual barcodes per packet, according to the manufacturer.